SBIG STF-8300M Self Guiding Package w/ mono ST-i, using Baader RGB filters. 10/26/2013 to 12/1/2013 Chino Valley, AZ... with CCDAutoPilot5 & CCDSoft. 135 min. ( 9 x 15 min. " 165 min. (11 x 15 min. " 195 min. (13 x 15 min. " Ha 330 min. (22 x 15 min. " eXcalibrator v4.25 for (g:r) color balancing, using 327 stars from the SDSS-DR9 database. PhotoShop for the [L:Ha][R:Ha]GB combine and final touch-up. 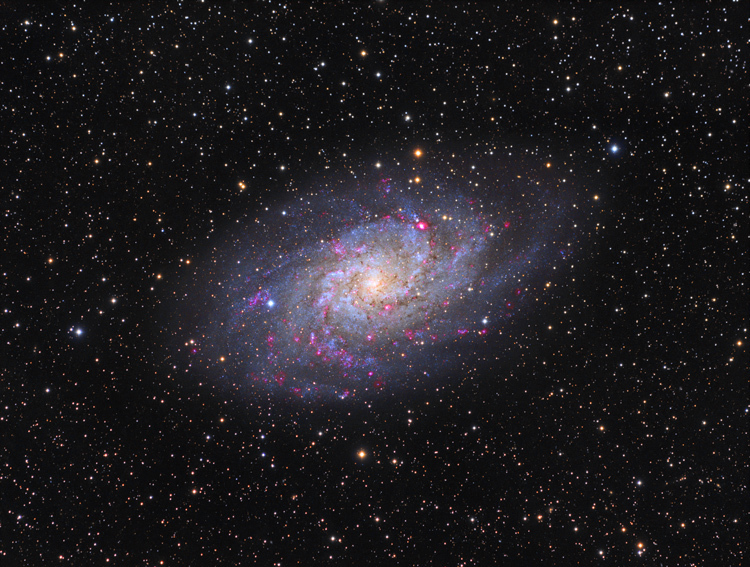 M33 is located in the constellation Triangulum, at a distance of about 2.7 million light-years. As the third largest galaxy in our local group, M33 is the most distant object visible to the naked eye. The first historical mention of the galaxy was by the Italian astronomer Giovanni Battista Hodierna before 1654. It was independently discovered by Charles Messier in 1764 and added to his famous catalog as entry number 33, hence the designation of M33. M33 contains many huge and bright HII star-forming regions; three even have NGC identifications. The largest, NHC 604, is located near the top of the image at about 1:00 o'clock from the galaxy center. NGC 595 is down a bit at 5 o'clock and NGC 588 is at the very bottom, image center. The lower image was taken with an Ha filter and mainly shows just the HII regions. For more info please see Wikipedia.